Context: Iron is involved in critical physiological processes within the hair follicle, suggesting that iron deficiency (ID) could disrupt hair synthesis. The relationship between body iron status and hair loss has been investigated in a number of studies, however, with relatively discrepant findings. 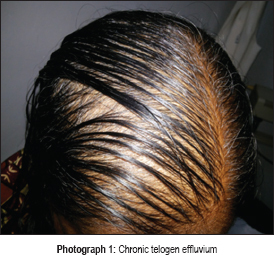 Aim: The aim of this study is to evaluate whether chronic telogen effluvium (CTE) and female pattern hair loss (FPHL) in patients were associated with decreased tissue iron stores, as measured by serum ferritin levels. Setting and Design: This was a cross-sectional study, conducted in a teaching hospital. Materials and Methods: Forty female patients aged between 15 and 45 years, having chronic diffuse hair loss, were recruited. Statistical Analysis Used: Statistical analysis used in this study was Mean ± standard deviation, Pearson's correlation coefficient, and one-sample t-test. Results: The mean serum ferritin levels in all participants, CTE, and FPHL were 18.6 μg/L, 16 μg/L, and 36.64 μg/L, respectively. Almost 57.5% of participants had serum ferritin levels <12 μg/L indicating ID, and 15% of participants had serum ferritin levels ranging 13–20 μg/L indicating iron depletion. Twenty-five percent of participants had serum ferritin levels ranging from 21 to 70 μg/L, indicating that serum ferritin levels were lower than required for normal hair cycle. Since there is a wide range of serum ferritin level (6–160 μg/L), a cutoff level of 41 μg/L was used to observe ID. There was a significant difference between the mean serum ferritin levels of participants as compared to the cutoff level of serum ferritin. Mean serum ferritin levels of all participants and in participants with CTE were low. Many participants had serum ferritin levels less than the normal lower range. The participants showed ID, at cutoff level of serum ferritin (41 μg/L), which was significant. Conclusion: Participants of this study had low serum ferritin levels at different definitions of ID, and the participants showed ID, which was significant. Hence, chronic diffuse hair loss was associated with decreased iron stores. An average normal scalp has about 100,000 hairs, with approximately 86% being in anagen, 1% in catagen, and 13% in telogen. With telogen effluvium (TE), the ratio shifts to 70% anagen and 30% telogen, with daily shedding of up to 300 hairs. TE along with female pattern hair loss (FPHL) and chronic TE (CTE) accounts for the majority of diffuse alopecia cases. Abrupt, rapid, generalized shedding of normal club hairs, 2–3 months after a triggering event, indicates TE while gradual diffuse hair loss with thinning of central scalp/widening of central parting line/frontotemporal recession indicates FPHL. Excessive, alarming diffuse shedding, coming from a normal looking head with plenty of hairs and without an obvious cause, is the hallmark of CTE. In a study from China, the prevalence of FPHL was 6.0% across all age groups. In Korean women, the prevalence at all ages was 5.6%. In the UK, 6% of women aged <50 years were diagnosed as having FPHL. No concrete data are available from the Indian subcontinent. An estimated life-time prevalence was 1.7%; however, this figure is not a reliable estimate. The common causes of chronic hair loss in females include thyroid disorders, diabetes, polycystic ovarian disease, anemia, and hypoproteinemia. Other causes are stress, drugs, pregnancy, malignancies, chemotherapy, etc. In most cases, the diagnosis can be made clinically and the condition treated medically. The most common causes of iron deficiency (ID) are menstrual blood loss and pregnancy in premenopausal women. A review of research shows that 72% of women with diffuse hair loss have an ID. Iron is involved in many processes within the hair follicle, suggesting that ID could disrupt hair synthesis. It is described that iron-dependent genes in the hair follicle bulge region may be affected by ID. A low ferritin concentration is very specific for ID. Sinclair in his study found no direct relationship between low serum ferritin and hair loss. Rasheed et al. in their study found that serum ferritin levels in TE and FPHL cases were significantly lower than in controls. The relationship between body iron status and different types of hair loss has been investigated in a number of studies, however, with relatively discrepant findings. Therefore, this study evaluated whether CTE and FPHL were associated with decreased iron stores as measured by serum ferritin levels. These findings have implications regarding understanding the triggers for hair loss, clinical trial design, and therapeutics. The study was conducted in the Department of Dermatology, Venereology and Leprosy, KLES Dr. Prabhakar Kore Hospital and Medical Research Centre, Belagavi. It was granted by the JNMC Institutional Ethics Committee of Human Subjects Research. A sample size of 40 was selected based on the formula. All female patients aged between 15 and 45 years, having CTE and FPHL, attending KLES Dr. Prabhakar Kore Hospital and MRC, Belagavi, were recruited as per the inclusion and exclusion criteria. All the consenting female participants of age group 15–45 years, with chronic diffuse hair loss, diffuse thinning of hair, and patterned hair loss. Participants who did not give consent, who were on iron therapy, undergone gastrointestinal/scalp surgeries, suffering from trichotillomania, hormonal abnormalities, and who were on medications for systemic disorders. An informed and written consent was obtained from each participant. A thorough physical and clinical examination of each participant was carried out, after eliciting detailed history and only those who fulfilled the inclusion criteria were included in the study. A detailed history was taken and dermatological, systemic examination was carried out. Diagnosis of CTE [Photograph 1] and FPHL [Photograph 2] was made on clinical examination and by performing hair-pull test [Figure 1]. The FPHL was graded using Ludwig's scale [Figure 2]. The data were noted in a pretested and predesigned pro forma. Serum ferritin levels of the study participants were measured by standardized method in Hi Tech laboratory of KLES Dr Prabhakar Kore Hospital and MRC, Belagavi. Analysis of result was made using mean ± standard deviation and Pearson's correlation coefficient, and one-sample t-test was used wherever applicable. The results were expressed as percentage and significance. About 20–60 hairs are grasped between the fingers from the base of the hairs firmly, tugged away from the scalp. 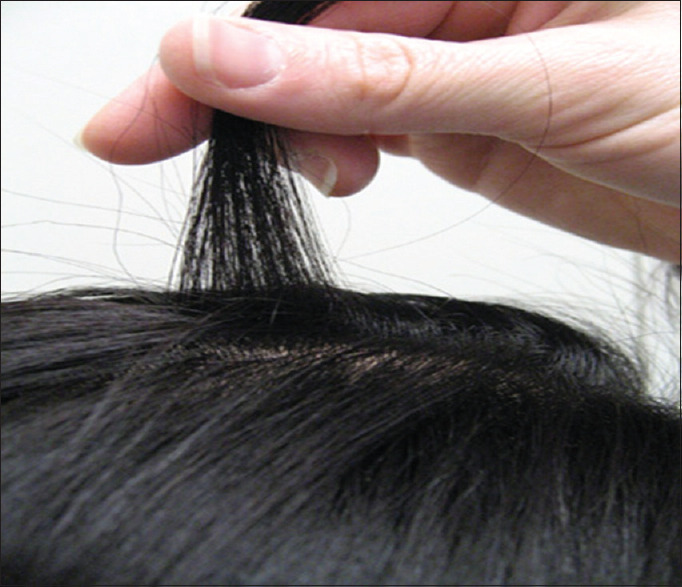 If more than 10% hairs are pulled away from the scalp, this constitutes a positive test and implies active hair shedding [Figure 1]. This test is based on the concept of gentle pulling of the hair to bring about shedding of telogen hairs. Ludwig's Scale  is used to diagnose the severity of FPHL [Figure 2]. Grade III: (Severe) Here, hair is so thin that it has difficulty camouflaging the scalp, rendering it visible to the naked eye. Serum ferritin estimation was done using ADVIA Centaur System Ferritin assay (Normal range: 6–160 μg/L). Forty participants were included in the study; out of which, 5 participants were diagnosed as having FPHL (12.5%) and 35 participants were having CTE (87.5%). The mean age of all participants, CTE, and FPHL was 25.18, 22.63, and 43 years, respectively. The mean duration of hair loss of all participants, CTE, and FPHL was 20.28, 18.37, and 33.6 months, respectively. Hair-pull test was positive in all participants having CTE and negative in participants with FPHL. Severity of hair loss in FPHL was assessed by Ludwig's scale, in which 80% participants had Grade II and 20% of participants had Grade III hair loss. The mean serum ferritin levels of participants are shown in [Table 1]. Mean serum ferritin levels were low in participants having CTE as compared to participants with FPHL, and the difference was statistically significant (t = 2.138, P = 0.0389*) by one-sample t-test. Twenty-three participants (57.5%) had serum ferritin levels <12 μg/L, indicating ID, and 6 participants (15%) had serum ferritin levels ranging from 13 to 20 μg/L, indicating iron depletion. Ten participants (25%) had serum ferritin levels ranging from 21 to 70 μg/L, indicating that serum ferritin levels were lower than required for normal hair cycle. Only one participant (2.5%) had serum ferritin level more than 71 μg/L, indicating normal range. 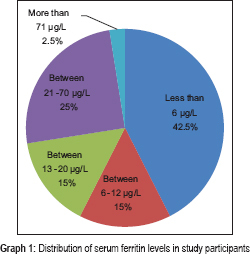 Seventeen participants (42.5%) had serum ferritin levels less than 6 μg/L, which is definitely below the normal range. Two participants (5%) had serum ferritin levels as 0 μg/L [Graph 1]. There is a wide range of serum ferritin level (6–160 μg/L), and many laboratories use lower limit as 6–12 μg/L, which gives low specificity for diagnosis of ID. However, as per the literature, a cutoff of 41 μg/L yields specificity of 98% and sensitivity of 98%. Hence, the participants were also analyzed for same and results are shown in [Table 2]. When cutoff level of serum ferritin was taken as 41 μg/L, there was a statistically significant difference between the mean serum ferritin levels of all participants as compared to the cutoff level (t = 6.722, P = 0.0001*, by one-sample t-test). Similarly, there was a statistically significant difference between the mean serum ferritin levels of participants with CTE as compared to the cutoff level of serum ferritin value of 41 μg/L (t = 7.924, P = 0.0001*, by one-sample t-test). Conflicting observational data has failed to determine whether an association exists between hair loss and ID in the patients. The relationship between body iron status and different types of hair loss has been investigated in a number of studies, however, with relatively discrepant findings. Therefore, this study was done to evaluate whether CTE and FPHL were associated with decreased tissue iron stores. Mean serum ferritin levels of this study participants were low (18.6 μg/L) as compared to the studies conducted by Bregy and Trueb  and Deo et al., where higher levels were evident (53.14 μg/L and 54.73 μg/L). Mean serum ferritin level of our study in FPHL (36.64 μg/L) was comparable to the study conducted by Malkud  (37.11 μg/L) while it was still lower in the study conducted by Rasheed et al. (23.9 μg/L). Mean serum ferritin level in FPHL was higher in the studies conducted by Olsen et al. (61.01 μg/L) and Bregy Trueb  (54.95 μg/L), as compared to our study (36.64 μg/L). Mean serum ferritin level of our study in case of CTE (16 μg/L) was comparable to the study conducted by Rasheed et al. (14.7 μg/L), indicating association between ID and hair loss. Mean serum ferritin levels in the studies conducted by Malkud  (39.39 μg/L), Bregy and Trueb  (40.09 μg/L), and Olsen et al. (51.81 μg/L) in case of CTE were found to be higher, as compared to this study (16 μg/L). The lower values observed in the present study as compared to other studies is because of noninclusion of postmenopausal women, inclusion of minimum duration of hair loss as 6 months, and proper selection criteria of participants, which eliminates confounding variables. In the study participants of other studies, the range of serum ferritin was very wide (2–304 μg/L), as compared to the present study (0–85.6 μg/L), which was less. Further, the mean serum ferritin levels were less in CTE as compared to FPHL, in all the above studies except in the study conducted by Malkud, where it was almost similar. In this study, participants were categorized based on their serum ferritin levels into four groups: ≤12 μg/L (ID), 13–20 μg/L (iron depletion), 21–70 μg/L (serum ferritin level lower than required for normal hair cycle), and ≥71 μg/L (normal ferritin level). In this study, 57.5% of participants had serum ferritin levels ≤12 μg/L, as compared to only 20.58% of participants in the study conducted by Malkud, indicating that majority of our participants were having ID. The percentage of participants having serum ferritin levels from 13 to 20 μg/L in this study (15%) was comparable to the study conducted by Malkud  (14.70%), which indicates iron depletion in the participants. The percentage of participants having serum ferritin levels from 21 to 70 μg/L was more in the study conducted by Malkud  (41.17%) as compared to our study (25%), indicating that serum ferritin level was lower than required for normal hair cycle in these participants. Only one participant (2.5%) had serum ferritin level ≥71 μg/L, in this study, as compared to study conducted by Malkud, in which there were 8 (23.52%) participants having serum ferritin level ≥71 μg/L. This indicates only one participant in our study had normal ferritin level and all other participants were having low storage iron as per the definition. Studies suggest that ID even in the absence of IDA may be associated with certain kinds of hair loss. These studies have different definitions of ID. The normal range of serum ferritin taken in this study was 6–160 μg/L. As there is a wide range in level of serum ferritin, there has been controversy over the cutoff level of serum ferritin, below which it can be defined as ID, triggering hair loss. Hence it was necessary to use a cutoff level of serum ferritin as adopted in other studies. Olsen et al. used three different definitions of ID: serum ferritin levels ≤15 μg/L, ≤40 μg/L, and ≤70 μg/L, to evaluate the prevalence of ID in their patients. Although many laboratories use serum ferritin concentrations of 10–15 μg/L as the lower limits of normal based on reference sample groups, this only gives a sensitivity of 59% and a specificity of 99% for diagnosing ID, while a cutoff of 41 μg/L yields a sensitivity of 98% and a specificity of 98%. Serum ferritin levels above 70 μg/L are considered as normal. Hence, same criteria were also used in this study. In the present study, 20% of participants had serum ferritin levels ≤15 μg/L, while in the study conducted by Olsen et al., 12.5% of participants had serum ferritin levels ≤15 μg/L. Our study results were comparable to other studies when cutoff level of ≤40 μg/L used, in which 60% of our participants fall under this group, while in the studies conducted by Olsen et al. and Rushton et al., 58.8% and 65% of participants fall under this group, respectively. Even our study results were comparable to other studies when cutoff level of ≤70 μg/L used, in which 80% of our participants fall under this group. In the studies conducted by Olsen et al. and Malkud, 75.4% and 82.35% of participants fall under this group, respectively. A study by Zhang et al. reports lower value of 35% when cutoff of ≤70 μg/L was used. In the present study, 68.57% of participants had serum ferritin levels ≤15 μg/L, while in the study conducted by Olsen et al., only 12.1% of participants had serum ferritin levels ≤15 μg/L. When serum ferritin cutoff level of ≤40 μg/L was used, 85.71% of participants in the present study and 63.8% of participants in the study conducted by Olsen et al. were falling in this group. Our study results are definitely comparable to other studies when cutoff level of ≤70 μg/L used, in which 100% of our participants fall under this group. In the studies conducted by Olsen et al., Rushton et al., and Malkud, 75%, 95% and 88.23% of participants fall under this group, respectively. There was negative correlation between duration of hair loss and ferritin (r = −0.202 and P = 0.211). This study has found that CTE and FPHL were associated with decreased tissue iron stores. In this study, postmenopausal women were not included, to avoid the influence of changed hormonal pattern on results. Mean serum ferritin level was low in the study participants indicating that ID could be the cause of hair loss in them. Majority of the study participants showed ID when different cutoff levels of serum ferritin were used. Hence, ID as a cause for hair loss was evident. As per this study, CTE was the most common type of alopecia in females, and the prevalence of CTE was highest in the young. ID as a cause for hair loss in participants with CTE was evident by their lower mean serum ferritin levels. Majority of the study participants with CTE showed ID when different cutoff levels of serum ferritin were used. In this study, the number of participants with FPHL was less because of noninclusion of postmenopausal women. FPHL was prevalent in the aged women. However, many of the participants with FPHL also showed ID when different cutoff levels of serum ferritin were used. Hence, the present study shows that association exists between hair loss and ID in the participants of this study. Further scientific studies are required with larger sample size to postulate quantitative association between different etiological factors and hair loss in iron deficient female. Olsen E. Androgenetic alopecia. In: Disorders of Hair Growth. New York: McGraw-Hill, Inc.; 1994. p. 257-83. Shapiro J. Diseases of the hair. In: Raykel R, editor. Conn's Current Therapy. Philadelphia, PA: WB Saunders; 1996. p. 739-41. Otberg N, Shapiro J. Hair growth disorders. In: Goldsmith LA, Katz SI, Gilcherst BA, Paller AS, Lefeell DJ, Wolff K, editors. Fitzpatrick's Dermatology in General Medicine. 8th ed. New York, USA: McGraw-Hill; 2012. p. 979-1008. Shrivastava SB. 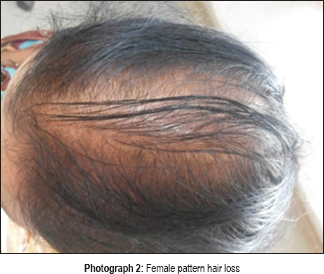 Diffuse hair loss in an adult female: Approach to diagnosis and management. Indian J Dermatol Venereol Leprol 2009;75:20-7. Wang TL, Zhou C, Shen YW, Wang XY, Ding XL, Tian S, et al. Prevalence of androgenetic alopecia in China: A community-based study in six cities. Br J Dermatol 2010;162:843-7. Hunt N, McHale S. The psychological impact of alopecia. BMJ 2005;331:951-3. Trost LB, Bergfeld WF, Calogeras E. The diagnosis and treatment of iron deficiency and its potential relationship to hair loss. J Am Acad Dermatol 2006;54:824-44. Rushton DH, Ramsay ID, James KC, Norris MJ, Gilkes JJ. Biochemical and trichological characterization of diffuse alopecia in women. Br J Dermatol 1990;123:187-97. Elston DM. Commentary: Iron deficiency and hair loss: Problems with measurement of iron. J Am Acad Dermatol 2010;63:1077-82. St. Pierre SA, Vercellotti GM, Donovan JC, Hordinsky MK. Iron deficiency and diffuse nonscarring scalp alopecia in women: More pieces to the puzzle. J Am Acad Dermatol 2010;63:1070-6. Sinclair R. There is no clear association between low serum ferritin and chronic diffuse telogen hair loss. Br J Dermatol 2002;147:982-4. Rasheed H, Mahgoub D, Hegazy R, El-Komy M, Abdel Hay R, Hamid MA, et al. Serum ferritin and Vitamin D in female hair loss: Do they play a role? Skin Pharmacol Physiol 2013;26:101-7. Shapiro J. Assessment of the patient with alopecia. In: Hair Loss; Principles of Diagnosis and Management of Alopecia. 1st ed. London: Martin Dunitz Ltd.; 2002. Kantor J, Kessler LJ, Brooks DG, Cotsarelis G. Decreased serum ferritin is associated with alopecia in women. J Invest Dermatol 2003;121:985-8. Moeinvaziri M, Mansoori P, Holakooee K, Safaee Naraghi Z, Abbasi A. Iron status in diffuse telogen hair loss among women. Acta Dermatovenerol Croat 2009;17:279-84. Bregy A, Trueb RM. No association between serum ferritin levels >10 microg/l and hair loss activity in women. Dermatology 2008;217:1-6. 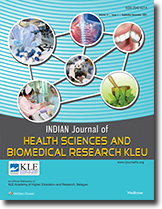 Deo K, Sharma YK, Wadhokar M, Tyagi N. Clinicoepidemiological observational study of acquired alopecias in females correlating with anemia and thyroid function. Dermatol Res Pract 2016;2016:6279108. Malkud S. A hospital-based study to determine causes of diffuse hair loss in women. J Clin Diagn Res 2015;9:WC01-4. Olsen EA, Reed KB, Cacchio PB, Caudill L. Iron deficiency in female pattern hair loss, chronic telogen effluvium, and control groups. J Am Acad Dermatol 2010;63:991-9. Rushton DH, Norris MJ, Dover R, Busuttil N. Causes of hair loss and the developments in hair rejuvenation. Int J Cosmet Sci 2002;24:17-23. Zhang X, Caulloo S, Zhao Y, Zhang B, Cai Z, Yang J. Female pattern hair loss: Clinico-laboratory findings and trichoscopy depending on disease severity. Int J Trichology 2012;4:23-8.